Animal Man #1 | Hey Adults! Comics! 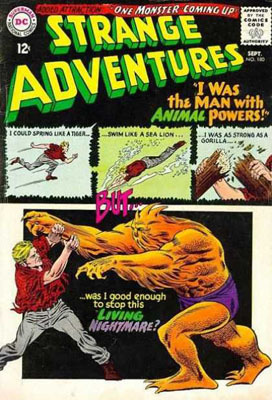 Animal Man was an occasional story in Strange Adventures and I was always excited to find a new one. Since I wasn’t getting or reading the comics in any particular order (it didn’t really matter back then as most stories were self-contained) I would sometimes have several Animal Man stories at once. Back then, he was a fairly standard hero and he eventually faded from comics, not to reappear until Crisis on Infinite Earths when DC dredged up every character that had ever graced its pages. 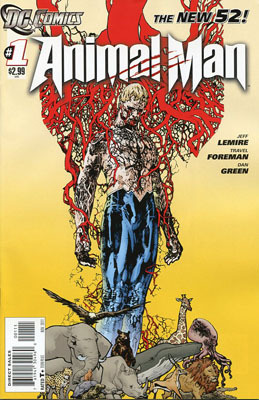 Since Crisis, Animal Man hasn’t been a “normal” hero. Like the Doom Patrol, they decided weird was the way to go, not that that’s a huge surprise when you know that his first author post-Crisis was Grant Morrison. The Grant Morrison take on Animal man has infused every incarnation since and this new version of the character is no different. The magical field that covers the planet called “The Red” is back from Animal Man’s Vertigo days and now there are three surreal creatures called the Hunters Three that will be the main adversaries in the series. When it comes to this kind of a series though, there’s no telling if they’ll be villains or heroes opposed because of an inability to communicate and understand. One of Animal Man’s limitations, that I’d always liked, seems to have gone away. He used to only be able to take the powers of animals that were nearby and it used to be one at a time. In this first issue, he takes what he considers a “standard cocktail” of animal powers, mixing several for effectiveness. He also grabs the hide of a rhino, so distance doesn’t seem to be an issue. If they were going to go in that direction, I’d have liked to see them explore the ability he had during one of DC’s recent giant events: he had the ability to tap into any creature in the universe to mimic their abilities. As he had no idea what most of these creatures were, interesting storylines could have come from his exploration. This could be one of the better series coming from the reboot, but it is going to take quite a few issues before that’ll become clear. I’m wondering if they’ll hold off interacting with other heroes or much of the outside world given his place in the timeline. It could make the storytelling very tricky. Not being able to interact with the rest of the DC universe is what soured Giffen on the Ambush Bug, it could put a damper on a promising series here too. This entry was posted in Uncategorized and tagged Animal Man, Crisis, DC, Vertigo. Bookmark the permalink. Pingback: Swamp Thing #1 | Hey Adults! Comics!